I understand that it might be difficult to spot the difference if you dont know what to look at. I am however hesitating a bit to rearrange the lamps, as it would feel very inconsistent (it is arranged like it is irl for a reason). Maybe even less light coming out? Could there instead be another way to distinguish that a lamp is blinking? (Just FYI Polish and Czech signaling is very similar.). So I would suggest using the nice new transparency features to put some semi transparent rays around the light = in X shape for front facing light, and a longer beam for rear facing light. Yes, that was also one of my initial ideas to have stripes out of the lamp. Maybe now with the alpha blendings. Compare with the left most signal that has two full lit lights. Any thoughts, readers of this thread? I am afraid that I cannot get these to work even by clicking the link: the Imagur page is visible, but with no picture in it. I have made all my uploaded pictures go into a public album, does this help? Sadly not; I wonder whether it is an issue with my adblocking software? Thank you, but I was thinking that that server one day gets closed down, but that is maybe too far out in the future (ie several years)? Also, I was unsure wether the server was ment to be like dedicated to the experimental development or if it is more "free" to use? That is my concern! I always think it is so sad in forumthreads when the pictures disappear. I think I will try a bit more with Imgur, and possibly shift to eg flickr or something else if the problems persist! Sorry for the offtopic, at least it's partially offtopic. It is never my intention for anything to disappear. It seems SMF is...... rather fragile, and the help there is very unhelpful. I was not able to get sufficient help to fix the problems, so attachments and avatars are lost. :/ I'm very sorry. Sorry doesn't bring the files back, mind. But I *am* sorry anyway. But it should be safe. So if someone needs a place that is backed up, I can create account(s) on the main server, no worries. That server also has 2TB. Basically, we should have enough space. And I will never leave the community - at least not as far as I could foresee. I haven't seriously played Simutrans in years, though I pick it up from time to time (I wish it had more SimCity features); so it's not like I'll get tired of Simutrans and leave. I'm still here. (well, and not *tired* of Simutrans). Okay, enough babbling - basically to say: I am glad to try and help make anything that makes life easier/better for the community to the best of my ability. Thank you Isaac! Your server it will be! So any thoughts about this from readers of this thread? How do you best model flashing lights? I can finally see the pictures - splendid! Actual flashing lights would require a very complex change in the code, but I see what you have done in the lower picture, which looks good, if perhaps a bit too subtle for it to be noticeable except on close inspection. Incidentally, and slightly off-topic, a question to Isaac - you write that you would like Simutrans to have more "SimCity features"; can you elaborate? I ask because one of the planned major projects for Experimental is improving the town growth code, and I am considering options to allow players to build city buildings much like real railway companies did in the 19th and early 20th centuries to stimulate demand for their own services, as well as earning rental income (based on demand, in turn based on transportation) from city buildings bought using the existing mechanism, so that transport networks can in part be funded by property rentals, as the privately run railways in Japan are. This may well be a few years off unless I can get some more developers on board, but I should be interested in your views all the same in light of your comment above. Isaac, what do you think of the blinking? So, rather low activity from my side lately, mostly due to trying to do many things combined with limited time! But, I have been playing around with signals and signalboxes and painted a bunch of signal boxes which I think did come out rather OK. However, the quite advanced signalling of Exp..Extended gives some challenges as how to present the different types of signals, and I have been thinking a big chunk on it recently. Something I was considering was to add a small square yellow sign on the choose signals. That would then stack with the other signs, so an absolute choose signal would have both the square and the absolute block sign. I also wondered about the need to specify choose signals in their icons, ie with "CHO". I have not done this yet, as this would affect all choose signals and might state the obvious. I know the Czech pakset uses a combination of a number and a letter, but I dont remember if it is finnish or not. I also dont know if the graphics on the map will be different as well. The Brittish pakset dont have anything on the icon of the signal, and the signals themself are not different (example: absolute block and track circuit block daylight signals). Do you think this is a clear separation of the signals? Do you have any comments or would you propose any change? Just to explain the czech pakset icons. In first place - czech pakset is not fully fit for experimental, so there are no signal boxes and the choices are not final. On the other hand there are many signals with the same function, just for aesthetics. Extended: A-autoblock (default clear, permissive), while S is default danger and absolute, number telling the aspects so there is 3A, 4A, 3S, 4S, ... two aspect signals are without number., ES - end of signalling (switch to drive by sight). 3P - is for 3-aspect presignal for standard, or two-block (platform) signal if it ever happens. Signalling method is not hinted in any way - at the moment everything is circuit block. The plan is to have mechanical as absolute block, color-light signals as track circuit, 3/4-aspect as cab signals. Ok, so "S" will be permissive signals and "A" 'nonpermissive'? How will you do with token and one train staffs (assuming you are implementing these)? And, if you implement it, daylight color variants of absolute, token and one train staff? I'm not really sure yet. The main thing is that token machines are unknown here and one-train staffs really a minor thing. We have something that is similar in principle, but the permission to go is given by dispatcher via phone or radio. For that a set of signs would be used. (now they are used for narrow gauge). If I ever use absolute block at all then I would probably put all 2-aspect signals as absolute block, and all 3,4-aspect signals as track circuit or cab-signal. Or I will make the switch from absolute block to track-circuit with different signal design. Now I have 3 models of daylight color signals: 1950's (soviet), 1960's (soviet with czech improvements), 1970's (original czech design still used today). There were some earlier designs (since 1927), which we do not have in the pakset yet. So those may be used for absolute block too. 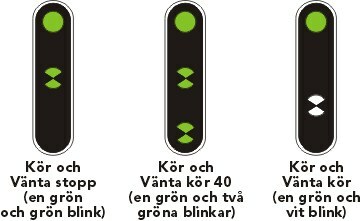 Using this philosophy for swedish signalling you could use the white rim on signals as a distinction between early (absolute block) and modern (track circuit) daylight signals. I think I will have both with and without rim track circuit block signals. I painted the "ABS" sign and I think it looks ok on the icon. Incidently I also added the yellow small square on the signal graphics for choose signals, and I think that looks ok too, but there will not be any special message on the icon, as it should be obvious. The new double block, however, I think would justify from such a icon message, only, what should it say? Can anyone figure out a short three letter message that would make sence? I have not yet figured out any sign to put on the signal graphic that would match both semaphores and daylight signals, and Im considering to just use the same graphics as their single block counterpart. There will only be a handfull of these signals and generally only one double block signal available with a signalbox at any given time. 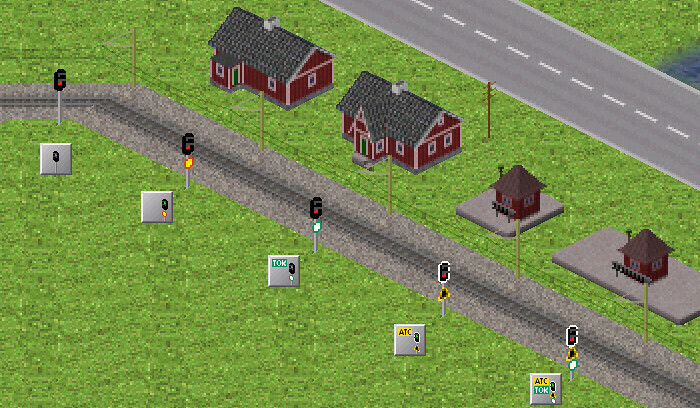 Also there were 2-lamp main signals (red/green) that were protecting road crossing (with triangular yellow [V] sign). However, on the same track there were also standard crossing signals - one lamp showing either red or white, and related triangular forsignals. So I think that these were block signals combined with crossing signals.